For the past two years, students of Sci-Tech Modi’in Ironi Daled High School have been writing and publishing articles in the online encyclopedia Wikipedia, expounding on Jewish towns in Poland that were razed during World War II. 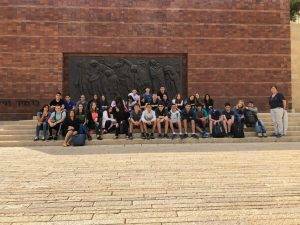 Recently, the school was awarded an award from Yad Vashem Holocaust Remembrance Center, as part of a commemoration competition. During the previous academic year, the school’s students had written 11 articles, and during this year they’ve written 11 more. 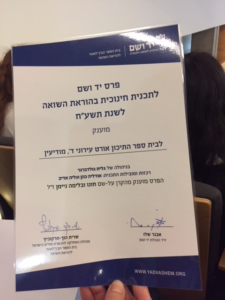 During the moving ceremony, the award was given to school principal Galit Goldberger, along with the school’s Hebrew Studies coordinator Odelia Cohen, and History teacher Galia Adiv, who’ve led this project for the past two years. During the 2017-18 academic year, the project drew 11 schools of the Israel Sci-tech Network, comprising some 320 students, 11 Hebrew teachers, and ten subject teachers teaching subjects as diverse as microbiology, science, math, history, and art. All in all, 88 articles were published so far, and more are due for publication once completed. The writing of each article is preceded by some research of the topic by the students, in order to get to know the towns in which thriving Jewish communities once lived, and are no more. This initiative is part of the Hebrew Wikipedia Project which is led by the Israel Sci Tech Network’s Goralnik Institute, in collaboration with Itamar Nehama, Education Program Coordinator at Wikimedia Israel. In the framework of this programme, which is a part of the Hebrew Language curriculum for ninth- and tenth-grades, the students are required – in groups, in pairs, or individually – to conceive, write and publish a Wikipedia article. Sci-Tech Modi’in Ironi Daled High School chose to focus on writing articles about Jewish towns in Poland which were eradicated during WWII. The school’s tenth-graders assigned themselves to groups, and each group picked a town out of a given list, focusing on articles which had not been previously published on Wikipedia. The students had lessons on how to write and structure an article, step-by-step from start to finish. Further on the academic year, the students will attend an editing workshop, facilitated by Wikipedia representatives. The students put a lot of work into their articles during lessons, and at the end of the process the articles are published online. “In the process of writing our article about Simnas, a town located 23 km west of Alytus in Southern Lithuania, we studied the town’s history during the Holocaust, as well as the advantages of its location in Lithuania, the chronology of the town, the education of the town’s children and the residents’ occupations during that time. In the course of our work we got to know about those towns, and about what happened to them during the Holocaust. Through the research into the town’s history we acquired a different perspective on the reality of the Holocaust, comparing to what we’d known about it previously. This is the second successive year of this project in our school. We believe this is an important, meaningful project, which got us connected to our roots as part of the Jewish people. We published our article with help from instructors and volunteers working with Wikimedia Israel. They helped us acquire new skills, which enabled us to upload the article to Wikipedia. The workshop was interesting, as well, and we would like to take this opportunity to thank the Wikimedia Israel representatives, and our teachers who were with us throughout the process. The workshop was attended by a Yad Vashem representative, and during our work she spoke with us about the learning and inquiry process we’ve been through, and asked each group to tell about our town and what we’ve learned about it.